What drives the Collective Knowing & Learning of the #MTBoS community? 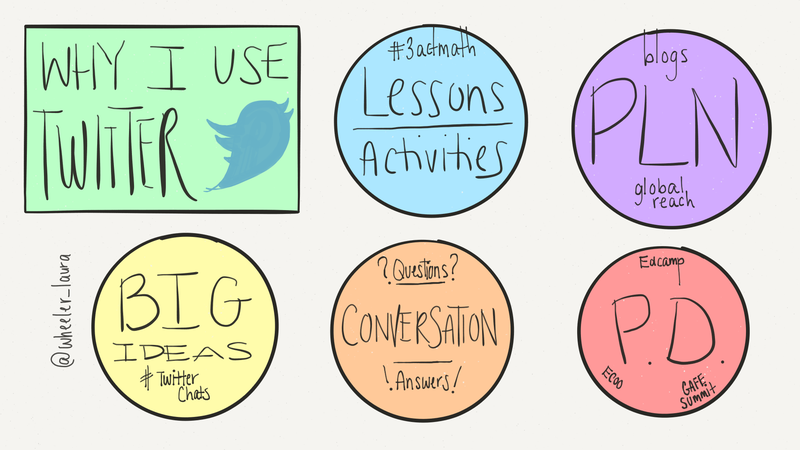 #MTBoS: The Math Twitter Blog-o-sphere. Do you participate? Contribute? Creep? Math teachers seem to have carved out a particular niche using Twitter & blogs to share & learn from each other in order to better our teaching. Teachers in other subject areas are often wondering, why doesn’t this exist for my subject? How exactly does one instigate & support a #MTBoS for a different subject area? Why are so many Math teachers so engaged in this professional learning community via social media? Stimulating sustainable mathematics teacher collaboration can be challenging in many commonly found professional development contexts. Despite this, an unprompted, unfunded, unmandated, and largely unstudied mathematics teacher community has emerged where mathematics teachers use social media to communicate about the teaching and learning of mathematics. This paper presents an analysis of one episode where teachers engage in a prolonged exchange about responding to a common mathematical error. Analytical tools drawn from complexity theory are used to explain moments of productivity. Results indicate that enough redundancy and diversity among members is necessary to make conversations productive. Identified sources of redundancy indicate the ‘taken-as-shared’ values of this group. Full article available from: https://www.researchgate.net/publication/316994276_Exploring_generative_moments_of_interaction_between_mathematics_teachers_on_social_media [accessed Jul 27, 2017]. Do you ever read a great article or blog post and think I HAVE to share this with my colleagues! So you email everybody the link & say you have to read this. And then maybe 1 or 2 people actually read it? I find so many great things on Twitter & blogs (#MTBoS) that I want to share with my colleagues, but they often don’t have (or make) the time to check them out. So when I happened upon a tweet about Learning in the Loo I thought it was genius – a captive audience! 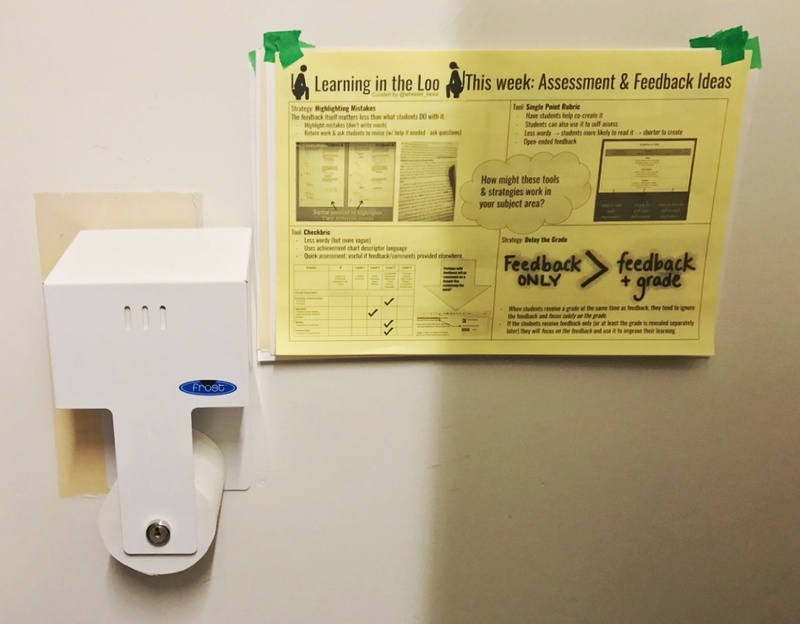 So I have made it a habit to create & post a new Learning in the Loo 11×17″ poster in each staff toilet in our school every 1 or 2 weeks this semester. I curate the amazing things I learn about online & turn them into quick read how-tos or ideas to read while you … “go”. And it just occured to me that I should have been posting them to my blog as I made them. But now you can get a whole whack of them at once and next year I’ll try to remember to post them as I make them. The whole collection so far can be found here with printing instructions. Feel free to make a copy (File –> make a copy). Also the sources of images & ideas are in the notes of the doc above too. What would you share in your school’s first Learning In The Loo poster? About a year ago I hosted the #BFC530 chat on Twitter for the first time. When you submit a topic idea (mine was to share the video clip that had the most impact on your teaching) you are then asked to host the chat if you can. The chat starts at 5:30 EST & then repeats for each time zone (so three more times again). Never heard of sketchnotes? Have a look here. So I woke up at 5:00am (30-45 mins. earlier than usual) to get myself ready for school (dressed, hair brushed & minimal makeup) before tuning in to host the 5:30 Eastern time at home in the dark. The 5:30 timeslot is the one that I usually tune into myself; usually lying in bed after the alarm goes off. So I recognized many of the participants & man, does it go fast. I had such a hard time keeping up with all the great tweets, trying to retweet & reply to as many people as possible. And just like that, it was 5:45 & finished. It was a Thursday, which is the day I meet colleagues for a weekly breakfast near our school. We usually get to the restaurant around 7:00 – 7:30 but I wanted to get there in time for the 6:30 EST (5:30 Central time) so that I could eat breakfast between that one & the Mountain time one. I jumped in my car & rushed to the restaurant. The 7:30 chat (5:30 Mountain time) was pretty quiet with only a few people checking in. Same for the Pacific time zone chat by which time I’d arrived at school & hosted from my classroom before the first bell rang. I get a lot out of participating in the #BFC530 chat so I’m happy to host when I can come up with a worthwhile topic idea. I’m not sure I’m very good at hosting as I find it hard to reply to everyone that participates, but there are so many regular participants that help with that aspect too, it’s so great! A most excellent chat this morning #bfc530! Thank you. Loads of ideas to run with. If you’d like to read through the entire chat, here it is with the beginning of the chat at the bottom & end of day tweets at the top of the page: here! The first title wasn’t so great because I’ve been “on” Twitter since May 2009 according to my Twitter profile. But for a long time I just didn’t get Twitter … what was I supposed to write about? Who’s reading what I post anyway? (Answer: no one at the time!) 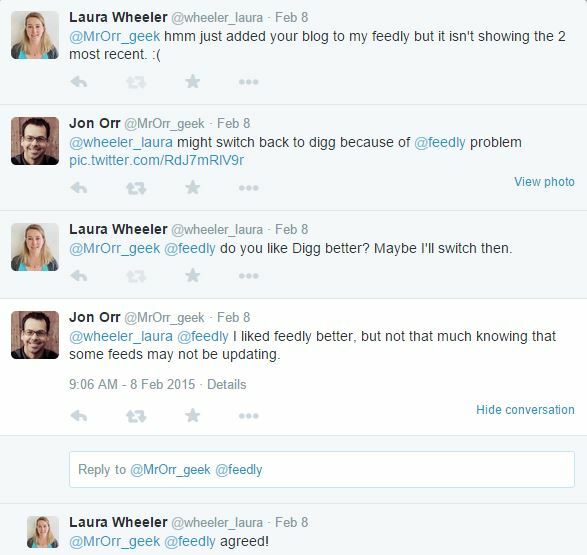 It took a couple of years before I really understood how to use Twitter to get what I wanted out of it. The second title didn’t get to the point. I like Twitter for lots of reasons outside of my teaching life, like keeping up to date on breaking news stories. The third title sounded off-putting. Who am I to tell you what you should or should not do? So I settled on the fourth title; I’ll tell you why I find Twitter useful and you can decide for yourself whether or not you might like to try it out if you haven’t already. 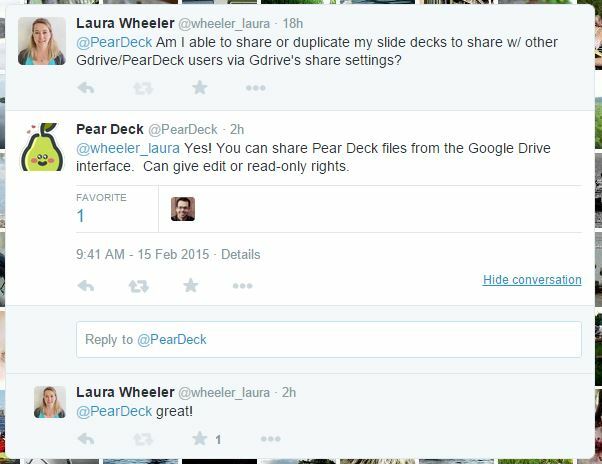 Teachers on Twitter tend to be a very share-y bunch! Twitter users like @MaryBourassa & @AlexOverwijk share great lesson ideas for the MFM2P course that I teach year after year. Sometimes they share tidbits in 140 characters and add photos, and sometimes they link to their blogs which go into greater detail on the lessons. Both these teachers are in my school board but at other schools. Twitter allows me to see what happens in their classrooms! A big game-changer for me a few years ago was Dan Meyer‘s 3-act math. Again, the material was mostly on his blog, but Twitter was often where I would find the links to his blog posts; reminding me to go read it. I work with some pretty amazing teachers at Ridgemont HS, but I also want to learn from people outside of my school. Twitter lets me connect with teachers elsewhere in my board and around the world! I have a list of blogs that I read regularly via the Digg Blog Reader app for my phone/tablet. The first blog I ever read was Dan Meyer’s. Through his blog & his tweets I found others I wanted to read as well. Following and engaging with people on Twitter has helped me find other teacher blogs that I find helpful to add to my list. The subject specific Twitter chats are great for this. My current favourite is #msmathchat which occurs each Monday evening from 9-10pm. People also post to the hashtag during the week in between designated chat times. My PLN’s tweets make me think deeply about the HOW and WHY of my pedagogical choices. Often these get me thinking about a topic or idea that I then discuss face-to-face with my colleagues in my building! Twitter was where I first heard about Ed Camp Ottawa and about ECOO’s annual conference where I ended up facilitating a workshop on Twitter for Teachers. Why do you use Twitter? What have I missed? Leave a comment below! What is this EdCamp thing anyway? A few weeks ago my VP, Lino Degasperis, told me about an upcoming professional development (PD) event called EdCamp. It was to take place here in Ottawa, on a Saturday, free of charge. I had never heard of an EdCamp before, but I have since learned that the first one was hosted in Philadelphia in 2010 and their popularity is on the rise! I signed up, figuring it was bound to be a good event as it was being run, in part, by Erin Paynter who I’ve followed on Twitter for some time now and she posts great stuff that I like & use. According to my pre-camp research, EdCamps are “un-conferences” designed for teachers by teachers. But that doesn’t quite tell the tale nor is it perfectly accurate. First thing’s first: EdCamp is on a Saturday (or at least this one was) so the people attending are so engaged & interested in education that they’ve given up a precious day from their weekend to attend! That says something. It’s also free to attend (thanks to generous sponsors) so it’s accessible to anyone & everyone. 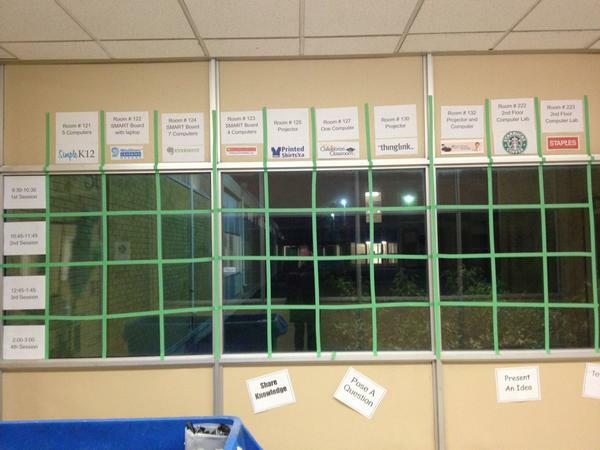 Here is the EdCampOttawa schedule before any participants arrived. Here the schedule is filling up with sessions participants are not only interested but have generated the ideas for themselves. Post-it notes get moved around and grouped & re-grouped according to themes throughout the day. Participants and presenters are one and the same! The EdCamp organisers used the phrase “let your feet do the talking”; at any time if a session you’re attending is not what you thought it would be or starts to veer away from what you need, you are welcome to leave that room & check out another! On a side-note, that schedule also happens to look great with all the funky coloured post-it notes! A work of art unto itself. So what did this wind up looking like throughout the day for me? My 1st session was a discussion on the issue of “teaching the curriculum VS teaching the students what they need”. What struck me immediately was the variety of people in the room! We had VPs, teachers, student-teachers, tech consultants from the board and a high-school student. How awesome is that? Usually when I attend PD I meet teachers, sometimes I’ll meet admin members & consultants, but rarely are student-teachers and students in attendance themselves. What a rich conversation to be had with all these different perspectives on hand! There was no formal presentation; we each introduced ourselves, gave our opinions on the topic and asked probing questions of each other. Excellent discussions & ideas ensued. Next up I attended a session on Evernote. I walked in a bit late (which is OK at EdCamp because often the conversations you have with people in the hallways are equally as informative & engaging as the sessions) and sat down amidst a bunch of people working on laptops and iPads with this software/app that I have been hearing lots about lately. It became clear that nobody in the room had declared themselves as the formal leader; the topic had been put on the schedule board by a participant wanting to learn more about it. A little chatting revealed a few people in the room that had some or much experience with Evernote that they could share, others explained how they’d heard of colleagues using it, and most of us used the time to listen & get our hands dirty trying the program out on the spot! Various participants offered up their experience with Evernote & showed us how they use it on the projector. No “sage on the stage” here – everyone participates. A neat thing that happens, too, because no presenter is set on finishing a prepared workshop, conversations shift along the way. During the Evernote session, the topic of IdeaPaint came up and Richard Swandel told us about how he covered tables in the library at his school with IdeaPaint to create whiteboard surfaces on the tables, allowing students to draw, collaborate and problem-solve right on the tabletop itself! Others shared ways that showerboard can be used as mini portable white boards. And then via the back-channel on Twitter I heard that Rust-Oleum has a dry-erase paint available widely too! All in a session that had nothing to do with white boards! Speaking of the back-channel, it is so important for a conference or event to have a hashtag these days; one that is unique to the conference and clearly visible so that all attendees use the same one. I was able to follow the cool ideas being brought forward in sessions I wasn’t even attending by tracking the #EdCampOttawa hashtag on Twitter. In fact, folks that couldn’t make it out to the event were following it from home, out of town, or wherever they were in the world that day! There were so many great topics being explored and I got something out of every session I attended through-out the day as well as great interactions and ideas popping up in conversations in the hallways and over break & lunch times. The day finished off with a “smackdown”; a chance for everyone to share resources that they heard about throughout the day, putting them all into a google doc available to everyone. Oh and door prizes too; I won a 3-month premium subscription to Evernote! Who doesn’t love swag? This past year I’ve worked on forming a great PLN for myself on Twitter with educators from all over. I’ve offered a few workshops to get colleagues started using Twitter so that they can take control of their own PD as well. EdCamp strikes me as they same idea: teachers and interested parties taking control of their PD by seeking out & generating sessions in which they truly want to participate! No need to wait for your school or board’s PD days or conferences; EdCamp is one more way for me to connect with great teachers I wouldn’t otherwise get to meet and learn from. A huge thank-you to the organisers of EdCampOttawa 2012. I’ll be back next time! To find an upcoming EdCamp near you check here! 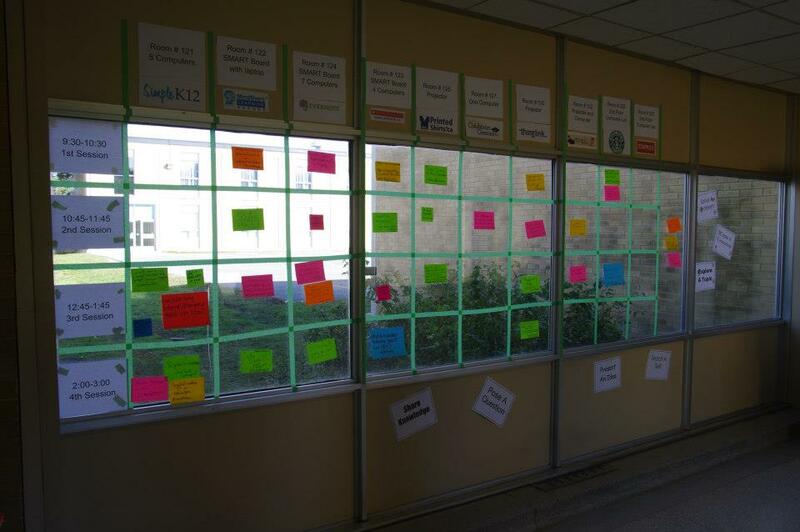 Have you attended an EdCamp? Leave your thoughts about it in the comments below.